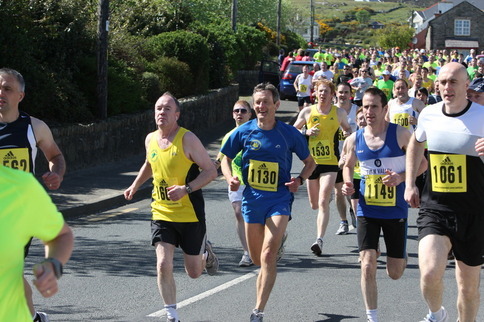 This entry was tagged ambition, Ballyliffin, Daily prompt, Donegal, Ireland, marathon, Running, sub three, trucker, writing. Bookmark the permalink. Oh hang in there. Whether you ever make it is irrelevant, you have a goal. I swam competitively and I know “winning” begins with the mind. Best of luck and enjoy your efforts. Some day if you want it badly enough you’ll get there. ps…i’m 43 with twenty five years smoking under my belt 🙂 I am not a competitive person, tric. I have purposely not overtaken some runners in races before. Simply because they looked like they were trying harder. 43? Frankie! You’re still a kid! (compared to me) Ditch the excuses and keep on keeping on. 🙂 You’re doing great. Pom-pom’s are a flying. Oohhh. The one with the great legs..I see you! Why aren’t you in front? (Nudge, nudge)😉 good luck on Sat. Don’t forget your goal! Try shooting for 67 minutes! Maybe it will increase your odds. Good luck. Huh. Even though I knew you were a ginger, I somehow thought you were 1130.Guess ‘cuz he’s front and center. It should be good fun. There is always a good atmosphere at this one. The final two miles are across a beach. Thanks Maggie. You are the good looking one! I’m a sucker for a red head :-). I know you will conquer that sub 3! One day, I’ll be running in Dublin. I’ll see you there! HA! Sorry this is off topic. I’m new to your blog and I’m really curious: is there really Irish honky tonk? Or is it American? If it’s Irish, does it sound like American honky tonk or is it different? Also, do you know a 1980s band called the Pogues? I really love them a lot. Sorry for all the questions. I appreciate opportunities to ask questions of Irish people, rather than rely on the media. I hope the O’Briens are behaving themselves. Over here, we’re a troublesome lot, heh ha! Nice blog you have – you’re a good writer. Claire, there will be no wool pulled over your eyes. Very observant! There is no such thing as Irish honky tonk. I was referring to the american honky tonk which seemed to me (growing up) to be strongly associated with trucks and truckers. I loved the Pogues. I still do. Shane MacGowan, the most unlikely front in the world, is a great songwriter. I think his song The fairytale of New York is the best selling (maybe second best) Christmas song ever. Their early stuff was great also. Kinda punk, kinda Irish, kinda genius. I saw them play live once or twice. I find it so hard to pick a favourite or even a top five because each song was so powerful in it’s own way. Poor Shane. His liver must be in shreds by now. Typical of so many geniuses, they all seem to be their own worst enemy. Like Sinéad O’Connor, who once sang a lovely duet (Haunted) with Shane.